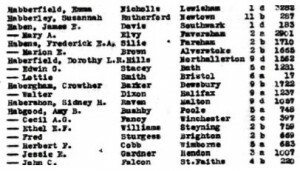 Sidney Heathcote Habershon was born in the 3rd quarter of 1889 in Redhill, Surrey and was baptised on the 28th of August 1889 at St Matthew’s church in Redhill, Surrey. 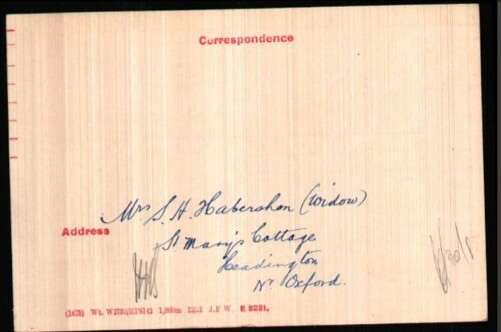 Sidney Habershon studied at Winchester College. Winchester College At War website reads that Sidney, after entering the College, rose to be Head of his House and a Commoner Prefect. In his last year he won the steeplechase. According to the 1918 Dorking and Leatherhead Advertiser, Sidney was a fine cricketer, and was in the Winchester XI. Sidney entered Clare College, Cambridge in 1908. At the time of the 1911 Census, Sidney was a boarder of journalist Clement Kille and boarding house keeper Amy Kille at 21 Avalon, Minehead. At this time Sidney was a student at Clare College in Cambridge. The house had twenty-one rooms. The household further comprised of three Cambridge students and a servant. 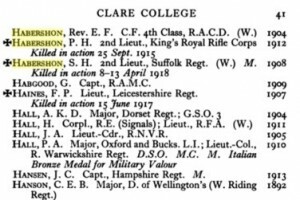 Winchester College At War website further reads that in 1912, Sidney became an Assistant Master at the Uppingham Preparatory School. He was still there at the beginning of WW1, but due to ill health, he was only able to serve in the Uppingham Officers Training Corps. Later, he moved to St Andrew’s School, Eastbourne and to the Eastbourne contingent of the Officers Training Corps. 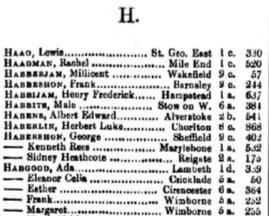 Sidney Habershon and Katharine Raven married in the 3rd quarter of 1915 in the Registration District of Malton, Yorkshire, North Riding. 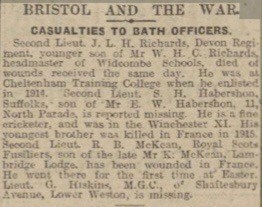 The couple had a son: John Lindsay Habershon born in the 2nd quarter of 1917 in the Registration District of Dorking, Surrey. 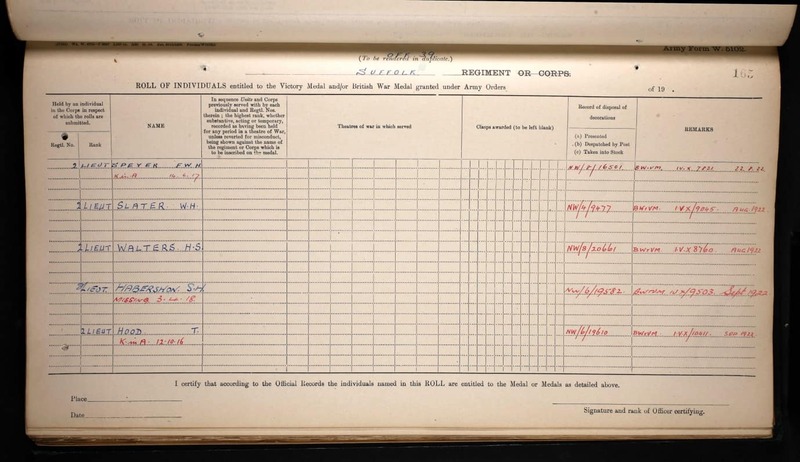 According to Winchester College At War website, by July 1917, Sidney had recovered enough to be transferred to the Suffolk Regiment. In November 1917 he disembarked to France with the 9th Battalion, the Suffolk Regiment and was slightly wounded at the Battle of Cambrai. 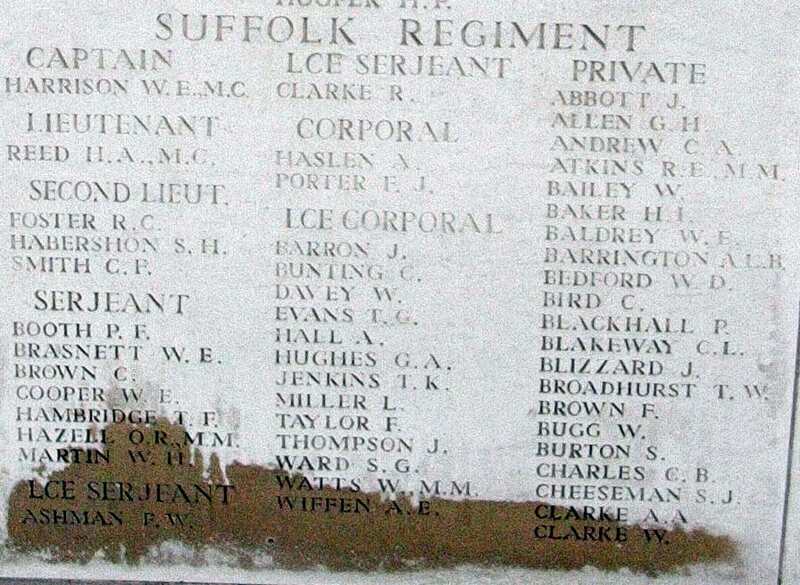 In February 1918, the 9th Battalion was disbanded and Sidney Heath was transferred into the 12th Battalion, the Suffolk Regiment. He was a 2nd Lieutenant. 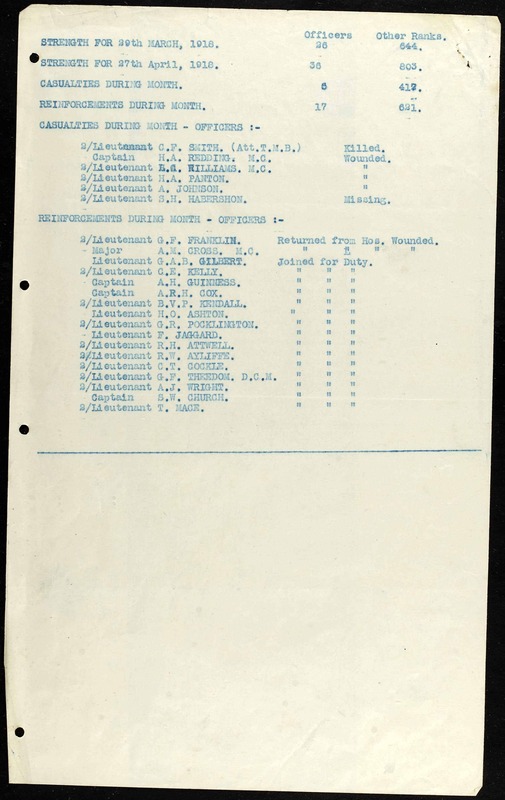 He joined his unit on the 5th of February 1918 in France. 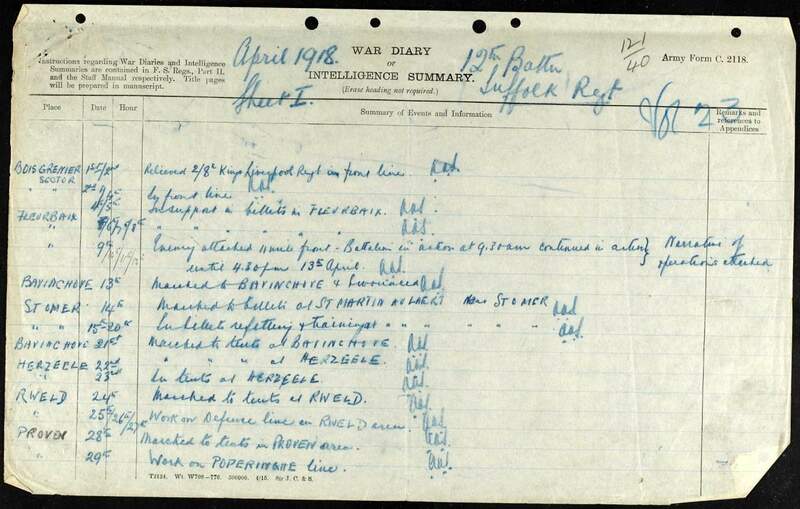 The 12th Battalion the Sussex Regiment War Diary reads that Sidney Habershon was killed in an action on or since the 9th to 13th of April 1918 in Fleurbaix, France. His body was never found. 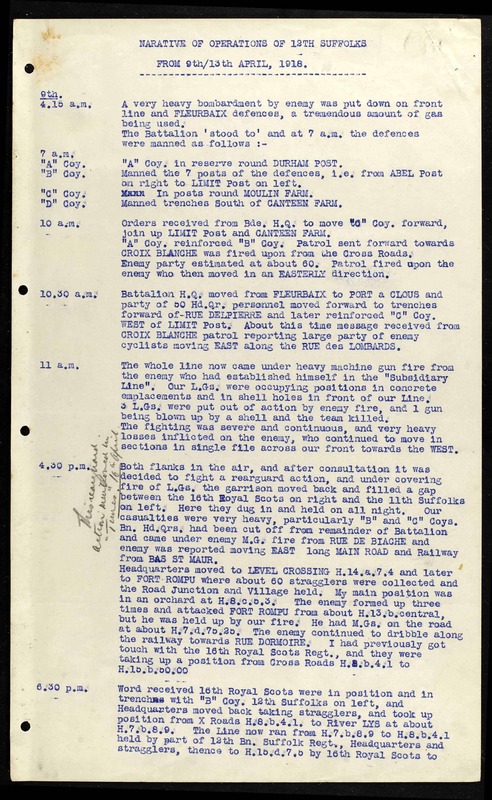 From 4.30am on the 9th of April 1918, the 12th Battalion, the Sussex Regiment was involved in a major defensive action of Fleurbaix, where a tremendous amount of gas was used, combined with heavy machine gun and shelling from Germans. 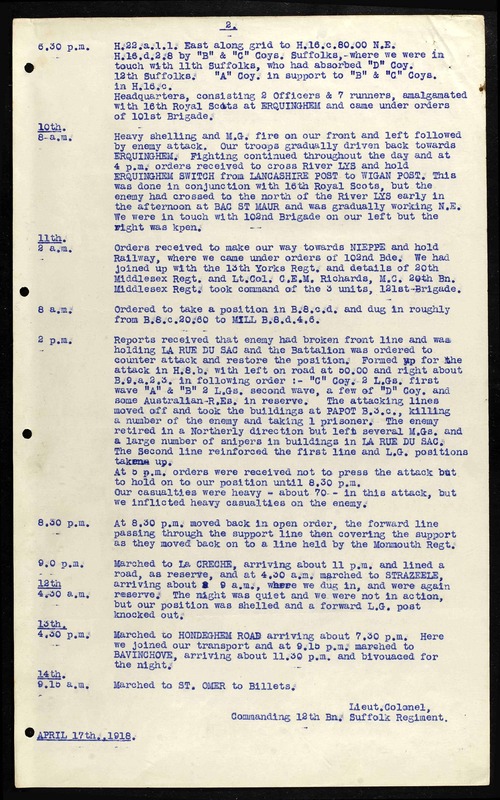 The enemy attacked 11 mile front and the 12th Battalion was involved in the defensive action until 4.30am on the 13th of April, when they retreated to Bavinchove. 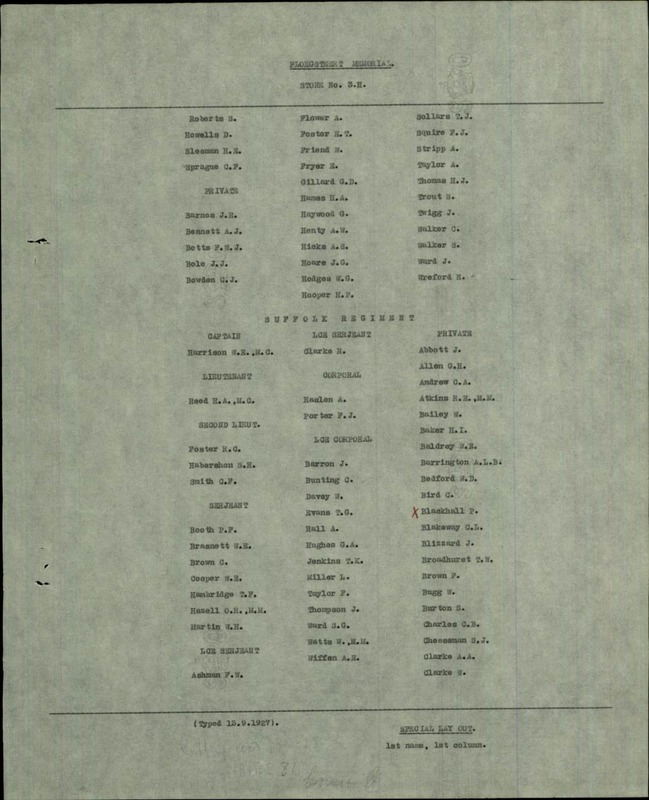 Sidney Habershon is commemorated at the Ploegsteert Memorial in Belgium on the panel 3. 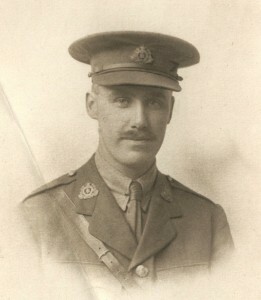 Sidney Habershon of Brook Lodge, Holmwood, Dorking, Surrey, the 2nd Lieutenant of the Kings’ Royal Rifle Corps, left to his brother, Reverend Edward Francis Habershon, and Reverend Lindsay Foster Browne, clerks, £921, 19s and 1d in probate. At the time of his son’s death, Edward Norton Williams Habershon Esq., lived at 11 South Parade, Bath. 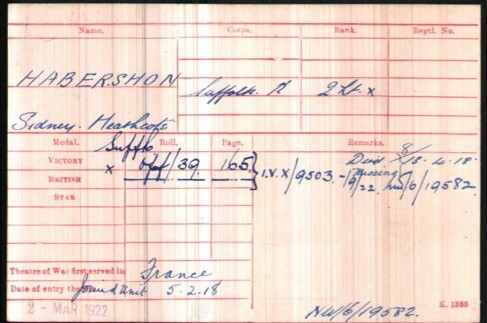 Sidney Habershon received the British War and Victory medals. Sidney’s son, John Lindsay Habershon, died in an accident near Craiglyn Lake on Aran Fawddwy Mountain, Llanymawddwy, Merionethshire on the 30th of March 1937. The 1937 Taunton Courier and Western Advertiser reads that John Lindsay Habershon, a 20 years old Oxford undergraduate, was found dead at the foot of a cliff on the Aran Fawddwy mountain, between Bala and Dalgelley. At the time of the accident, Haberson was at Pembroke College, Oxford and lived at Westway, Adderbury, near Banbury. He was staying with his grandmother, Mrs T.E. Raven of Granville House, Granville Street, Shrewsbury. He often spent his holidays at Shrewsbury and was well known by the St Mary’s parishioners. Habershon was one of 26 parishioners and friends of St Mary’s church, Shrewsbury, who left Shrewsbury, for an annual picnic. They went to Lake Vyrnwy, and Habershon, with other members of the party, set off to climb Aran Fawddwy mountain. The Reverend Gerald Harcombe of St Mary’s church, Shrewsbury, had told a Deputy Coroner that “he cancelled the original plan to climb across Aran Fawddwy to Bala as he did not consider it safe. But as the party was travelling by bus to Dinas there was “leg pulling” that there was no snow on the mountains. It resulted in a decision to climb Arran Fawddwy and trek on to Lake Vyrnwy. They reached the mountain top, and he noticed Habershon looking over the precipice.” Later, at the lake Vyrnwy Hotel, Habershon was found missing and a search party was organised. He crashed to his death over a 300 ft precipice on snowbound Aran Fawddwy. The Coroner returned a verdict of an accidental death. John Lindsay Habershon of Westway, Adderbury near Banbury, Oxfordshire, left to his mother, the widowed Katharine Habershon, £273, 2s and 11d in probate.